Minimus Championships 2019 – Saturday & Sunday 15th & 16th June – Millstreet, Green Glens Arena. Rule Change from 2016: IPC members who are over the age of 12 years on January 1st will be allowed compete at Minimus Hors Concours (HC). These members will be allowed ride and run in numeric order with their branch members but cannot be included on teams. They will swim according to their swim ability. This rule is to allow new older members or members who are not yet ready to compete at junior level the opportunity to take part in a national competition. HC members will be awarded points for each phase as per the rule book, however all HC competitors must compete as individuals. They cannot be included as a team member with their branch. Only branch rosettes for ‘club spirit, tack and turn out’ can be awarded to a HC member. The Minimus is a triathlon competition. It consists of a 2 minute swim, 1000m of running and cross-country riding. It takes place over a weekend. There are points awarded for each phase and the winner has the most points after the three phases. Tetrathlon is a very demanding competition with four parts: a 3 minute swim, 1500m of running, cross-country riding and target shooting. The Aim of The Pony Club Tetrathlon is to provide Members with a challenging competition requiring sound practical horsemanship and general athletic ability. 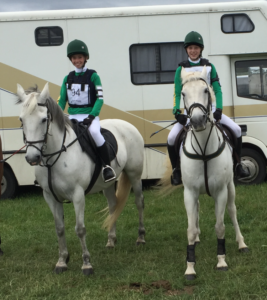 Thus all-rounders should be encouraged to further their interest in riding and the horse generally by combining riding with other activities, thereby retaining their interest in The Pony Club.